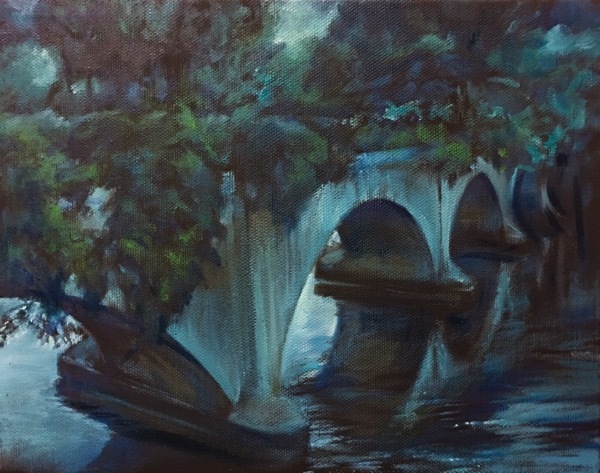 This is a new oil, an 8 x 10 on black canvas of The Bridge of Flowers in Shelbourne Falls, Mass. 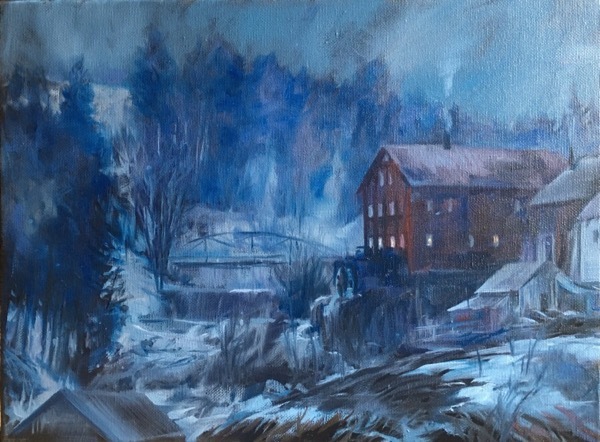 From an old photo I've created a nocturne of the first Rensselaerville, NY grist mill. It originally had a water wheel, as can be seen in this image. Also, the dam is visible and the first bridge, a "thimble" trussed bridge, and in the foreground is the roof of the old sawmill and timber piled up on the bank. I'm drawn to mills lately, grist mills, wind mills, and sugar mills from The Caribbean. It must be the combination of old functional technology and the attractive nature of these buildings. I'll paint more of this mill, but this is my first one. I hope you like it.